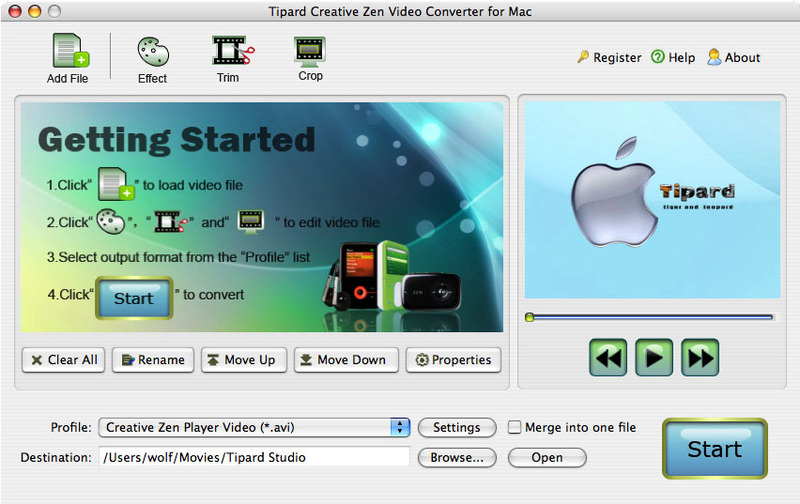 Tipard Creative Zen Video Converter for Mac grants you the ability to convert almost all video formats to your Creative Zen on Mac. So this Mac Creative Zen Video Converter can convert MPG, MPEG, MPEG2, VOB, MP4, M4V, HD videos to Creative Zen MP4, WMV, AVI, MPG video. This Mac Creative Zen Video Converter also can convert audio to audio and extract audio from video to Zen MP3, M4A, WMA and WAV audio formats on Mac. ...... interface. Just with a few of clicks, you would finish to convert video to Creative Zen on Mac. Moreover, Tipard Creative Zen Video Converter for Mac give you a hand to pick up your favorite part of your video, and crop your video region to your preferences, as well as set encoding parameters including resolution, encoder, frame rate, video bitrate to get the best video quality. A professional Mac Creative Zen Video Converter fully compatible with Mac OS X, support Leopard and Tiger, which manage on computers with either Power PC or Intel processors. 2. Powerful Mac Creative Zen Video Converter to convert video to Creative Zen on Mac. Convert MPG, MPEG, MPEG2, VOB, MP4, M4V, etc to Creative Zen video. Convert or extract the videos/audios to Zen MP3, AAC and M4A audio formats. Qweas is providing links to Tipard CreativeZenVideoConverterforMac 3.6.06 as a courtesy, and makes no representations regarding Tipard CreativeZenVideoConverterforMac or any other applications or any information related thereto. Any questions, complaints or claims regarding this application Tipard CreativeZenVideoConverterforMac 3.6.06 must be directed to the appropriate software vendor. You may click the publisher link of Tipard CreativeZenVideoConverterforMac on the top of this page to get more details about the vendor.